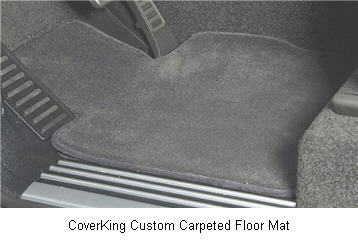 CoverKing Makes Precision Cut Custom Floor Mats for You! CoverKing was founded in 1986 and for the last three decades has been making all kinds of custom “cover” accessories for cars - car covers, seat covers, dash covers and floor covers(mats), just to name a few. CoverKing is meticulous in their design and manufacturing processes as evidenced by being the first in their business to implement an advanced CAD/CAM (Computer Aided Design / Computer Aided Manufacturing) end to end production model. Today using advanced 3-D digital scanning systems The company has 10,000+ patterns to insure a perfect design and fit for your car mats. So, expect a premium product when you purchase your luxurious custom carpeted floor mats or custom clear floor mats from this company. These custom carpeted floor mats are manufactured to exacting specifications insuring a complementary color match with your car’s oem carpeting and an improved fit for the car’s floorboard. These mats are constructed of either 40 ounce “Luxurious” or 22 ounce “Premium” high density nylon carpet which uses advanced stain and wear resistance technology. 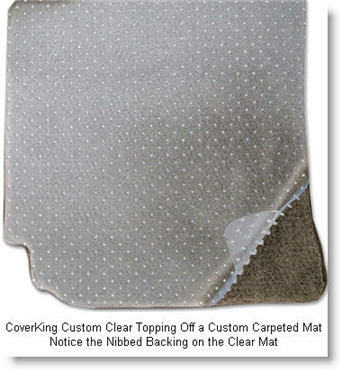 A non-slip nibbed backing is bonded to the bottom of the mats to prevent slippage. In a lot of cases a grommet hole is strategically placed to mate with the existing OEM anchor posts in your vehicle. If so ordered, the mats are custom embroidered to the customers spec and are edged with a matching velour binding. Six different configurations are offered for front, front/back, a single strip for rear of trucks, SUV’s, MiniVans and Cargo Areas. - 40 oz. or 22 oz. These custom clear floor mats are cut from heavy duty, thick, clear vinyl using the same patterns as the carpeted custom floor mats. Used on top of carpeted mats they allow the original color and logo of the carpeted mats to show through while protecting them from water and dirt. Or, these clear vinyl mats may be used directly on top of the car’s carpeting, replacing the OEM car mats and allowing the color and texture of the vehicles carpeting to show. A nibbed backing prevents slippage in either case. The mats wear well and resist discoloration. Cleanup with a damp cloth or hose. A Universal Absorbent Car Floor Mat can help prevent the buildup of water and dirt on either of these mats and simplify cleanup.